On Saturday we worked with Guides from the Carlisle area as part of their centenary celebrations. 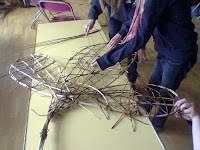 The girls made willow baskets and fish to take home and helped to make a large trefoil sculture which will be displayed in Tullie House museum later in the year. 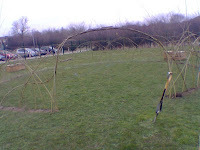 We have spent the last 2 days at Lostock Hall Community Primary School, Preston where we worked with the children to create a living willow dome and three willow arches. The weather was very different from last week - cold, wet and windy. 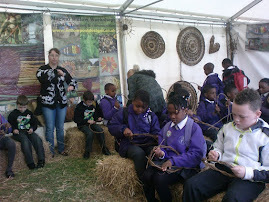 Despite the weather the children enjoyed being outside and working with natural materials. 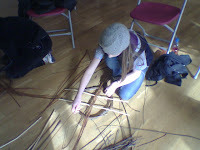 We continue to have a very busy living willow season - visiting schools, planting our withy beds and harvesting willow rods. 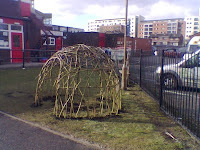 The weather has been very springlike this week and children have been coming out to help make the domes and tunnels without the need for winter coats and waterproofs. Steve worked at Greenbanks Primary School in Liverpool on Monday where he built a tunnel in an established garden area in the nursery playgound. The tunnel was over a path through lavender bushes and should look and smell great in the summer. 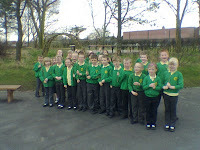 The nursery children were involved in the project and each child planted a willow rod. 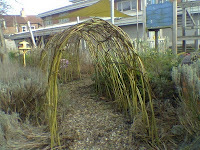 They have also been given the task of watering the tunnel to ensure good rooting of the willows. Steve also had 2 days at a nursery garden in Poynton, Cheshire where PlaySound www.playsoundplaygrounds.co.uk had built a new play area. 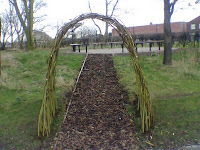 Steve built a lage willow tunnel over three new benches. 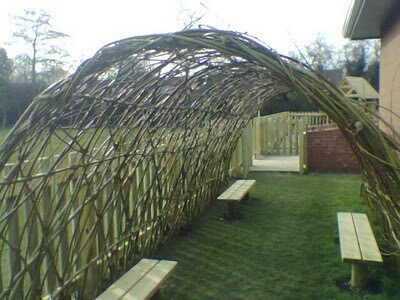 We also strated a project at Aldereman Leach Primary School, Darlington where we are building a storytelling area in the form of a willow enclosure. 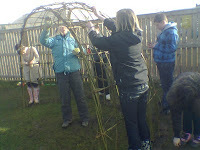 Work was started on a Groundworks Trust project at Sunnyside Primary School, Coulby Newham, Middlesbrough where we are creating a 'willow village' of several willow domes linked by tunnels. we have had another busy week. Monday and Tuesday saw us at St Lawrence's Primary School, Molesey near Hampton Court. 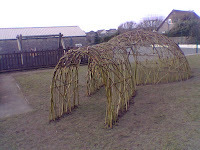 We built a large twigloo with tunnel and an arch entrance to part of their new eco area. The school already has some nice outdoor features such as a gazebo and recycled plastic benches and they will soon be adding a picket fence and fruit trees. On Wednesday and Thursday we were at a local school here in Cumbria at the village of Holme. 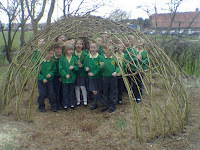 The children enjoyed helping to construct a twigloo, especially making the planting holes. It was great to work locally and be able to get to our new willow beds to plant more cuttings in the early evening. The willow beds are looking great now with some more of the roadside trees cut down to let more light in. Last years plantings have about 6 foot of growth so have done really well with no signs of deer or rabbit damage, which is a relief as the beds are in a very rural location. we have been busy working in schools all over the uk again. On Monday and Tuesday we were at Mayfield Primary School near Edinburgh. We could see Arthurs Seat and the Castle clearly from the school field. The weather was fine but there was snow on the ground and the soil was frozen. 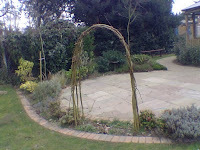 It was a job for a marquee stake and sledgehammer with the children helping by planting the willow rods in the holes. compost will be packed into the planting holes. From Scotland we went to Sacred Heart Catholic Primary School, Liverpool and Legh Vale Primary School, Haydock to finish off projects and then on Thursday and Friday we were in sunny Whitehaven at Bransty Primary School to make a dome and tunnel. The weather was bright and warm in the sun and it was a pleasure to drive through from Kendal to Whitehaven enjoying the views of the lakes and mountains. Today we went to Southport to try and get some potted willows from a wholesale tree nursery, unfortunately we were about 20 minutes after the listed closing time and the man there took great delight in telling us that we were too late and that he was going home. we won't ever be buying plants from him!! we spent a bit of time on our new willow beds getting ready for planting, laying down mulch and clearing brash.